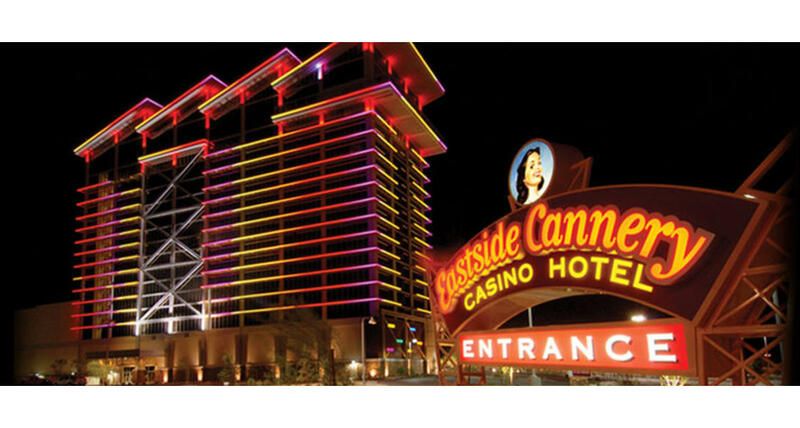 The inside of the Eastside Cannery Casino & Hotel is complementary to the building's architectural design. Inside, guests are transported to the age of industry. Large open truss ceilings, exposed mechanical and over-scaled detailing is throughout the property. There are elements of the past intermixed with hi-tech. Within the 16-story hotel tower, more than 300 guest rooms and suites feature floor to ceiling glass windows giving guests spectacular views of the mountains and the bright lights of the Las Vegas Strip. The oversized 450 square foot guest room decor and furnishings are reminiscent of the ongoing industrial theme of the property, but have a fresh 21st Century feel with wide screen plasma televisions in every room. Guests who book the corner window suites enjoy an exceptional view while soaking in their in-room spas in their 600 square foot surroundings. The five executive suites on the top floor include many amenities in their 900 square foot surroundings. There is also a Jacuzzi and a half-acre pool complete with cabanas on the property. The Pinups Bar focuses on the saucy 1960's pop art beauties with a new space age op art look. The zigzag ceiling murals depict life in the 1960's with glimpses into the ever-changing future; from imagery of man entering outer space to families riding futuristic rockets. The Eastside Cannery artwork celebrates the evolution of industry and embraces the optimism of the ever-changing future.